Armies are meant to fight other armies. Military forces are not designed to combat roadside bombs, civilians with a Kalashnikov, or evade ambushes in an alleyway or remote corner of a city. It is not only futile in the long term to demand our soldiers to break into houses (in the middle of the night) in order to weed out potential terrorists, but it makes little foreign policy sense. Great powers, like the U.S., USSR, and others have consistently learned that guerrilla warfare, either in rural areas like Vietnam and Afghanistan, or urban regions like Fallujah and Mogadishu, remove all the advantages possessed by superior weaponry. After Iraq, our country must never again succumb to the fear imposed by a terrorist attack, or the dream of nation building, and engage in urban and counterinsurgency warfare. When the political rhetoric of "they hate our freedom" and "fight them over there" overshadows the lessons of history, even the most powerful country will lose wars to goat herders and farmers willing to die in overwhelming numbers. In a 2007 interview, President Bush was asked if he was still a "credible messenger" on the Iraq War. His answer was, "I'm credible because I read the intelligence data and make it abundantly clear, in plain terms, that, if we let up, we'll be attacked. And I firmly believe that." In the future, leaders like Bush, Obama, and all other future presidents must include history lessons in their "intelligence reports." After the Battle of Dien Bien Phu in 1954, insurgents had already forced France out of Indochina; only after 55,000 French soldiers died in their war before our involvement. Not many people realize this, but France lost almost as many lives as we did in the region. U.S. troops entered Vietnam in 1964 in order to adhere to the Truman Doctrine and prevent the dominos of fledgling countries from falling into communist rule. According the National Vietnam Veterans Foundation, "2,709,918 Americans served in Vietnam (August 5, 1964 - May 7, 1975)." 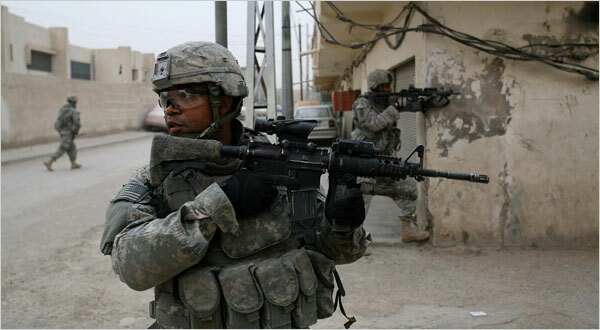 Of these over 2.5 million soldiers, 58,202 died and there were over 303,704 Americans wounded. For a nation that now has a volunteer army, 25% of total U.S. forces in Vietnam were draftees and they accounted for 30% of combat deaths in Vietnam. Exemplifying the asymmetric nature of counterinsurgency wars, around 1.1 million North Vietnamese and Vietcong died in the war. Because of the inability to differentiate civilian from enemy, about 2 million civilians died in Vietnam. Well, I didn't last too long in Vietnam... Two days after I reported into my outfit, they sent me out on patrol. We were supposed to be out for 5 days, but on the fourth night, the V.C. hit us hard. I won't go into all the details of what happened, you might say we got wiped out. Out of the 14 of us on the hill, 8 are dead and 3 of us are in the hospital. I've got a hole in my leg about as big as my fist, plus some small pieces of shrapnel in my foot and my shoulder blade. I feel pretty lucky - when I was on that hill with all those dead Marines around me, I felt like the luckiest person in the world...So I'll be here in the hospital for 5 or 6 weeks, and then I'll go back to 'Nam and try my luck again...Say hi to Ron and Linda for me, and write when you can. Pat Jasper's letter exemplifies the experiences of hundreds of thousands of Vietnam Veterans in that the enemy he fought was unseen and ambushed his patrol. More bombs were dropped on Vietnam than in all of World War II, but that didn't stop the Vietcong from implementing an ambush and vanishing back into the countryside. In a counterinsurgency war, all the advantages of a superior military power are mitigated by the fact that enemies know the terrain and can disappear within the local population. When 8 out of 14 Marines die (as stated in Mr. Jasper's letter) while patrolling a hill in another country, all the bombs in the world can't ensure foreign policy victory. After all the sacrifice of American soldiers, Saigon fell to Communist forces in 1975. The American and Iraqi soldiers came to this village of grape farmers and tribal traditions in the dark in search of a suspected insurgent, and left in the morning sunlight. The raid and the deaths prompted outrage on Monday in Parliament and in the local press, and coincide with a continuing debate about the future role of the United States military here. But the villagers and local officials vowed to pursue a tool of recourse deeply ingrained in American life: the lawsuit. "We are going to sue the Americans for it," said Mr. Hassan. "We will follow them with the legal process and the courts." Americans should never again send their men and women to engage in wars that require midnight raids on grape farmers. All our nuclear weapons, tanks, and aircraft won't help soldiers invade the house of a grape farmer. All of our money and resolve will amount to an eventual withdrawal, with the grape farmers living life in the manner they've done for centuries. Undoubtedly, such examples of urban combat not only create more enemies, but continue a cycle of violence that begins with fear of a terrorist attack, or glowing rhetoric about a "war on terror." While Black Hawk Down foreshadowed recent wars, and Vietnam was the result of the Cold War, Iraq and Afghanistan are the consequences of Bin Laden's attack on us. We've ignored the history of counterinsurgency wars and the futility of urban combat, with our fear of the next terrorist attack and with our need for revenge after 9/11. When political rhetoric eclipses the reality that advanced weaponry won't weed out a terrorist hidden in an apartment building, then we have today's nightmare in Iraq and the potential unraveling of Afghanistan in the future. The Taliban, Al Qaeda, and every other terrorist organization will never be a match for us, but they will lead us into other foreign policy tragedies if we forget the lessons of the past.